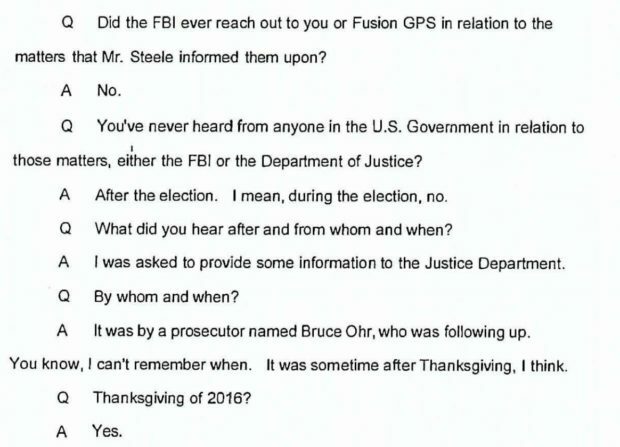 Fusion GPS founder Glenn Simpson told House investigators last year that he only met Department of Justice official Bruce Ohr after the 2016 election. But Ohr’s records show that he was in contact with Simpson as early as August 2016. Ohr’s wife worked for Fusion GPS on the Steele dossier project. Newly released Department of Justice records appear to conflict with testimony that Fusion GPS founder Glenn Simpson gave to Congress in 2017 about the timeline of his interactions with top DOJ official Bruce Ohr. Ohr, who was demoted from his position as associate deputy attorney general in December, maintained contact with Steele even after the FBI cut ties with the former MI6 officer over his unauthorized disclosures to the media. In his interview with House Intelligence Committee investigators, Simpson denied having contact with anyone from the FBI or DOJ regarding the Steele dossier and Trump investigation. “Did the FBI ever reach out to you or Fusion GPS in relation to the matters that Mr. Steele informed them upon?” House Intel investigators asked Simpson. Simpson acknowledged that he had met Ohr through organized crime conferences, but did not disclose that Ohr’s wife was working for Fusion GPS. Glenn Simpson’s testimony to the House Permanent Select Committee on Intelligence on Nov. 14, 2017. The Washington Examiner reported on Wednesday that Simpson sent an email with the subject line “Can u ring” to Ohr on Aug. 22, 2016. Ohr’s log shows he had contact of some sort with Simpson on that day. The Hill also reported that Ohr’s handwritten notes show that Simpson named several “possible intermediaries” between the Trump campaign and Russian government. One of the intermediaries was a “longtime associate of Trump” who “put together several real estate deals for Russian investigators to purchase Trump properties,” the notes said. Simpson’s admission that he met Ohr was progress in one regard. In his Aug. 22, 2017 testimony to the Senate Committee on the Judiciary, Simpson did not volunteer that he met Ohr. He was only asked in that interview if he had any interactions with the FBI. Simpson denied it but did not mention his interactions with the DOJ’s fourth ranking official. Simpson’s lawyer, Joshua Levy, did not respond to a request for comment for this article.